Bucharest is a fascinating city. I traveled to Bucharest knowing not much more than it being the capital of Romania in Eastern Europe. I encountered a city that is a lively capital full of enterprising people. On first glance it doesn’t has the polished grandeur of other European capitals. But the things making Bucharest so intriguing are hidden under the surface. Take a second glance and I’m sure you’ll love the city! Stories of Rroma tucked behind the facades of abandoned buildings, colourful murals just a few metro stops beyond the old city center, breweries and traditional restaurants. 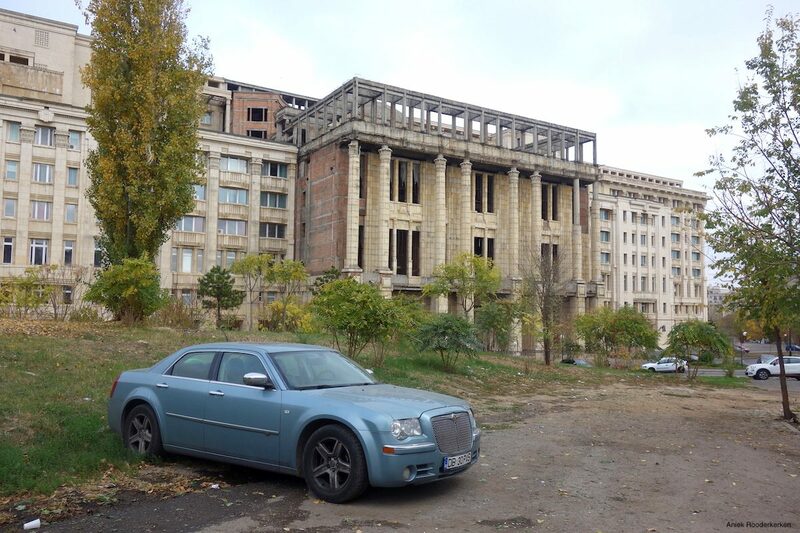 And don’t forget about those abandoned buildings showing the decades of Communist rule. 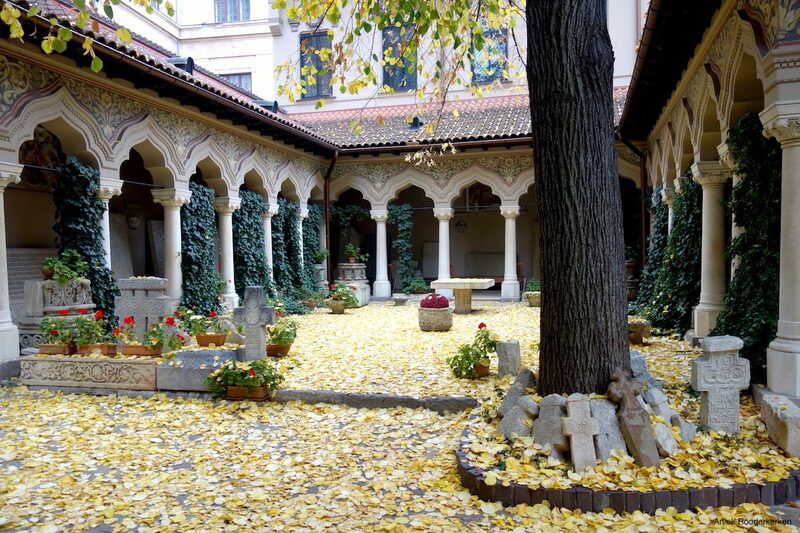 If you know where to look, you will inevitably fall in love with the hidden beauty of Bucharest. 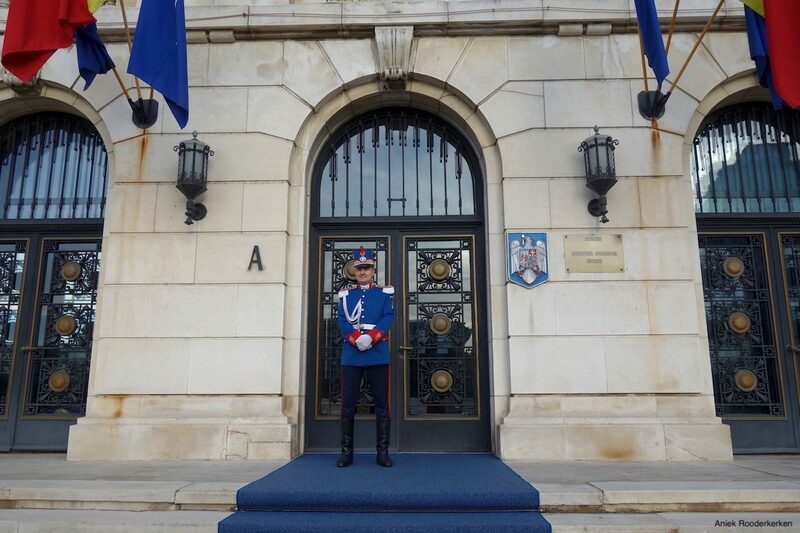 There is a lot to take in during a visit to Bucharest. I was lucky to have some people showing me around the city. 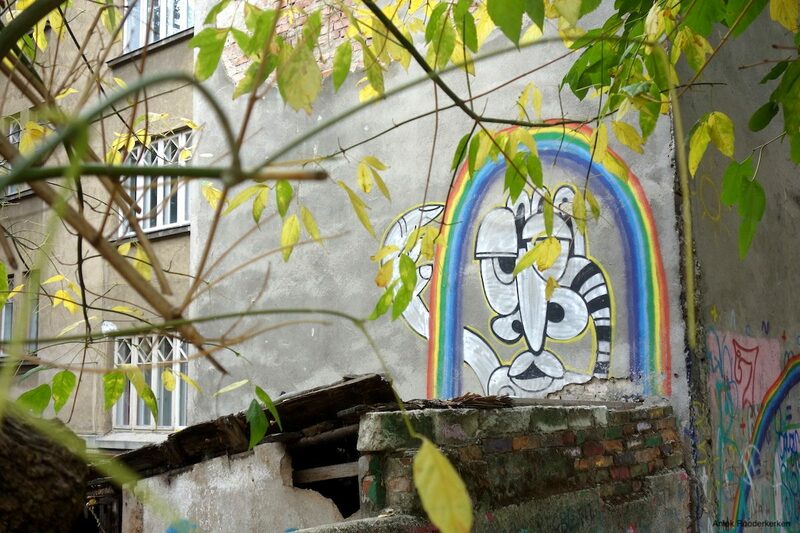 From the obvious Bucharest travel tips to the stories hidden under the surface of the city. From Vlad the Impaler to living through the tough times of Communist era. First thing I noticed was that the locals are rather proud of their history and really want you to explore and get to know the city. So here are all the things I discovered! Being in town for Experience Bucharest I was lucky to be invited to stay at the JW Marriot Bucharest Grand Hotel. This meant every day I walked to Old Town via the colossal Palace of the Parliament. It is the world’s second-largest administrative building. Only the Pentagon is bigger. It actually has over 1.000 rooms, even though three quarters of them aren’t used. 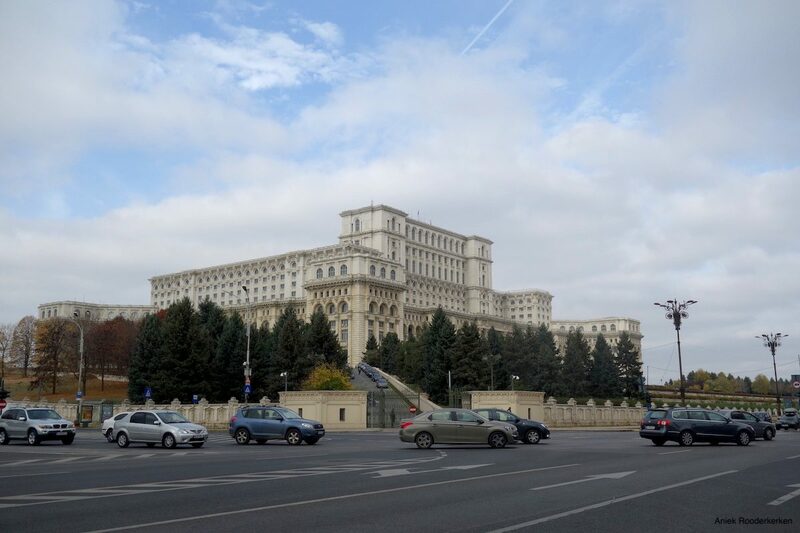 The palace was commissioned by Communist ruler Nicolae Ceausescu. It is therefore a controversial palace, a reminder of the regime under the dictator, but it is an integral part of what Romania is today. It was raised at an enormous cost: note that it was built in the 1980, when the people of Bucharest under Communist rule harshly had food, medicine and electricity. If you want to know more about the subject you can book a tour in the parliament building. If you don’t, you walk to Union Square, one of the largest squares in the city, surrounded by grey soviet blocks. You probably walk past some hidden secrets. To build the new Soviet-style buildings Ceausescu ordered the destruction of the old ones. This meant many churches, monasteries and other buildings were destroyed by the regime. In order to save those buildings from destruction, some of them were hidden away. They were moved hundreds of metres on metal tracks and hidden between the communist buildings. You should try to find some of them. 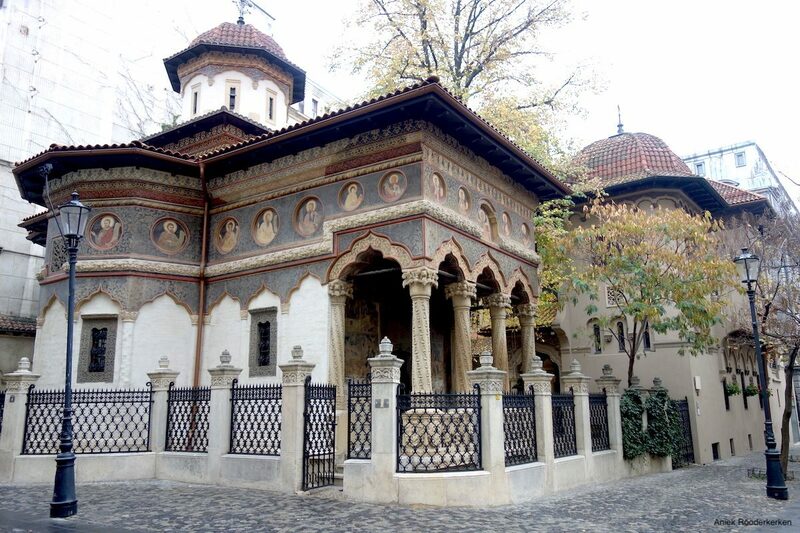 The most famous of the Bucharest churches probably is Stavropoleos Church in the Old City centre. You need more than a couple of minutes to admire this 18th-century church, with its facade with painted medaillons and its tiny courtyard filled with tombstones. This charming little church is worth the visit. Close by you’ll see Manuc’s Inn. It is the oldest operating hotel in Bucharest and it now houses a traditional medieval tavern restaurant. I’m not sure whether you can still call it a hidden part of Bucharest, since it is well know. But even if you’re not planning to eat at the restaurant, take a look at the beautiful courtyard. Speaking of the Romanian cuisine. 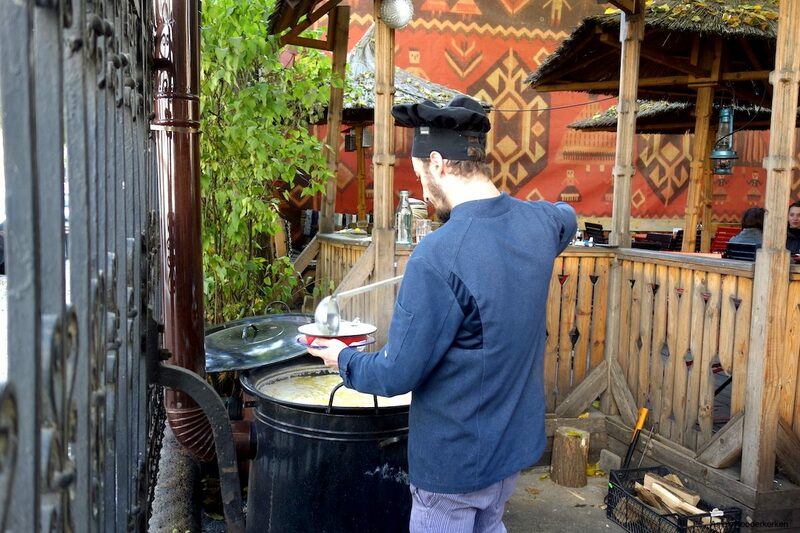 Looking for places that serve traditional food in Bucharest we also ended up at Caru’ cu Bere in the Old Town. It’s a bit touristy, but the food was good, and it’s worth going there just for the art nouveau interior. From the dishes to try in Romania, you could choose the meat rolls called Mici, or the Sarmale, cabbage rolls stuffed with minced meat. There also was a smokey eggplant spread that reminds me of baba ganoush. So yes, the Romanian food is heavy and rich. Think hearty stews and plates full of meat and potatoes with polenta on the side. If you dare, have a nip or two of Tuica, a Romanian beverage with a sharp bite of alcohol. One thing used in every dish is garlic. So when I heard of a culinary garlic tour in Bucharest I immediately subscribed. During the garlic food tour I learned all about garlic and Dracula (or Vlad the Impaler, as his name is Romania is) and above all we tasted a lot of garlic. So, we tried garlic soup, roasted potatoes with garlic, sausages with garlic and spreads made with… you guessed it, garlic. Meanwhile Ioanna Pătrășcoiu from My Secret Romania shared the darkest stories of Romania where vampires still exist and garlic (still in these days) plays an important role in protecting the people from evil spirits. Enough about food. From Caru’ cu Bere you could go to the National Museum of Romanian History. This museum showcases Romanian artifacts from prehistoric up to modern times. If you want to visit a museum in Bucharest, this is definitely a good choice. Instead I walk to Macca Villacrosse Passage – not to be confused with Victoria Passage, an alley covered with colourful umbrellas. Probably the most instagrammable spot of Bucharest. In history Bucharest was heavily influenced by French culture and architecture. For that reason Bucharest is often called the Little Paris. A place that reminded me the most of Paris was Macca Villacrosse Passage, two tiny and picturesque passageways hidden in the heart of Old Town. The bars look like they came straight from a Parisian cafe. 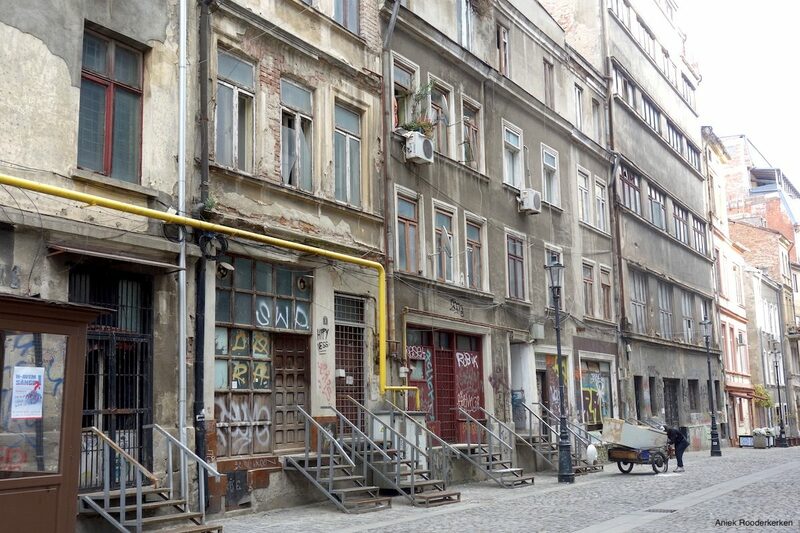 Not every part of Bucharest looks that polished, though. Some parts still look abandoned. But they might be more interesting that way. A more dark part of history you encounter at Revolution Square. The square got its name in 1989, when people overthrew Nicolae Ceaușescu and the Socialist Republic of Romania. You can still see the balcony where Ceausescu held his last speech, before he fled the crowd in his helicopter, only to be captured a few hours later. Walking on the square the Memorial of Rebirth looks down on us. The monument was built to commemorate the Romanian revolution, and it is also known as the potato in the toothpick. It not that popular, you can imagine. If you want to know more about the Communist history of Bucharest, I’d recommend the Bucharest Communist Tour by Open Doors Travel. The walking tour teaches you about the rise and fall of Ceausescu while you walk past Communist era landmarks and memorials. It covers life under the communist regime and shows how the years of Communism shaped Romania and life in Bucharest, even today. Also interesting is to take a look in the Neighborhood of Giants – there’s also a walking tour. 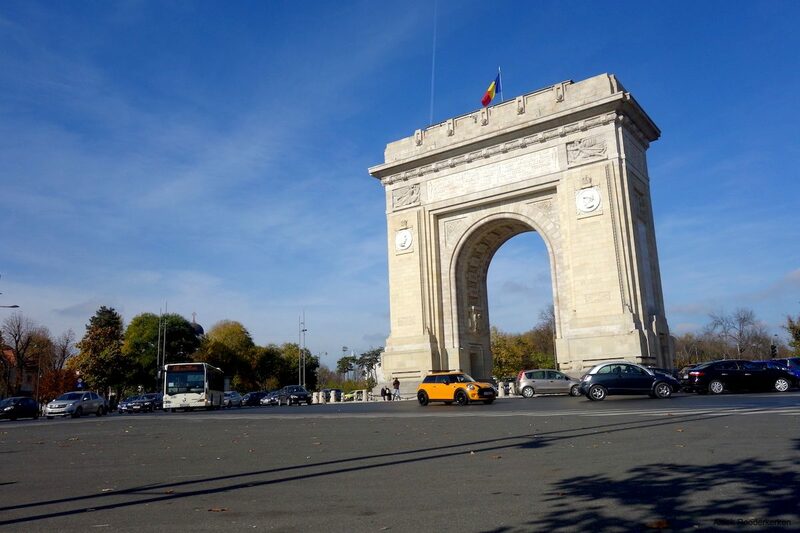 A bit outside of the city centre, but worth a visit is the Bucharest Arc de Triomphe. The structure celebrates Romania’s independence and you’ll find it near Herastrau Park. It is set in the middle of a traffic circle, with cars speeding around it. The arch is open for visitors only a few days day each year, but we were lucky – the Arch de Triomphe was opened specially for us. So we climbed up the arch and the view from the top was gorgeous. 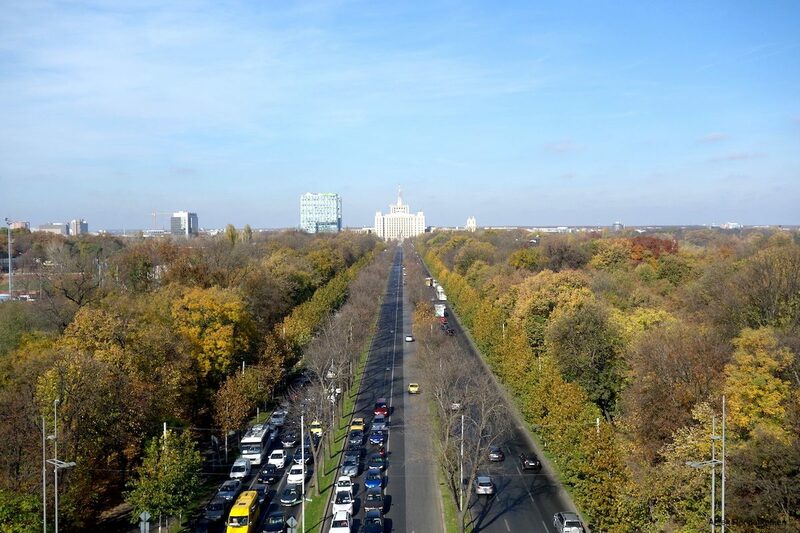 Tip: Combine the visit to the Arcul de Triumf with a walk through Herăstrău park, one of the biggest parks of Bucharest, and the nearby Village Museum. At the end of the day and after discovering all the these places there is just one place to go: Pura Vida Sky Bar. You need to climb several flights of stairs to enter the bar, but the workout is worth it. In the middle of the Bucharest city centre you can watch the sun set over the copper rooftops around you, with a well-deserved cocktail in hand. Bucharest… there’s something about this city. I don’t know whether it is all the stories hidden behind the buildings, or the old meets news atmosphere. But whatever it is, I’m sure one day I’m going back to Bucharest to discover much more of this wonderful city. And hopefully also of the stunning nature in Romania. Bucharest is a fascinating city steeped in history and tradition. It is an off-the-beaten-path and still fairly undiscovered destination that can seem rough on the edges. More the reason to visit this Eastern European country! Flying to Henri Coanda (Otopeni) International Airport (OTP) you can decide to fly a low-cost carrier, but I booked a flight with KLM, since it had the best flight schedule. While Bucharest has a good public bus system and metro line, it doesn’t connect to the airport very well. A better option is to take a taxi or even easier is Uber. 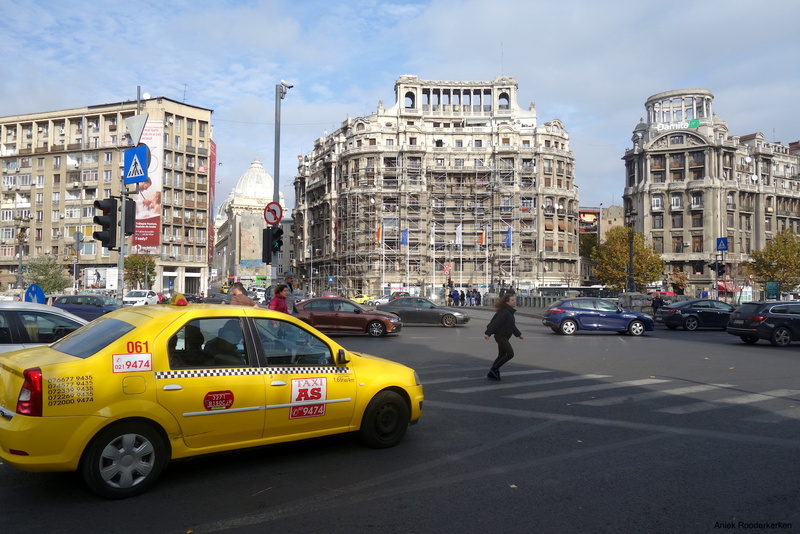 Within Bucharest, walking is the easiest way to get around. For longer distances I’d recommend Uber, since the service is cheap and reliable. Any 10-15 min Uber ride will cost around 2 euros. I actually stayed in two different hotels. First, the JW Marriot Grand Hotel Bucharest, a fancy hotel with lush rooms and a breakfast to die for. Next stop was Little Bucharest Old Town Hostel, a stylish and comfortable hostel. The location couldn’t have been better because it is in the middle of vibrant Old Town. The staff was very friendly, and the room was clean and with probably one of the best views in town. 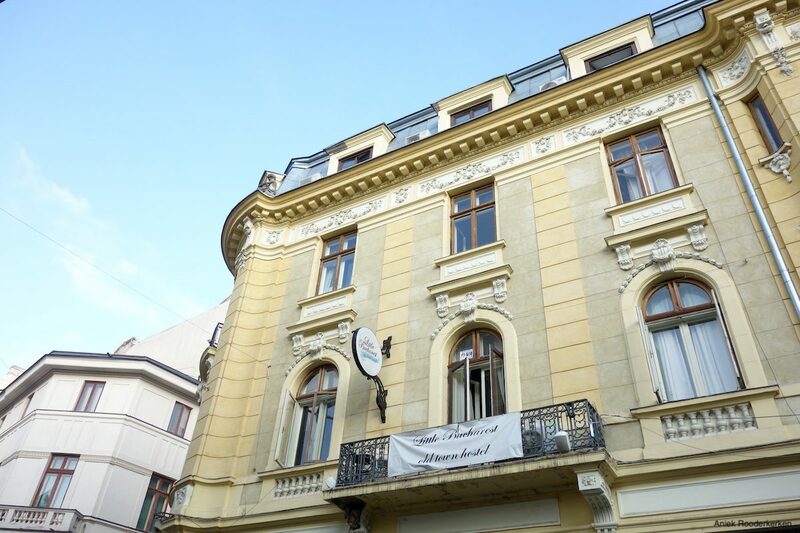 Check here for the best accommodation in Bucharest! I made this trip on invitation of Experience Bucharest 2018. I received free admission on several tours and trips. This article contains affiliate links.